Mark Duncan at Yachting Partners International asks me to squeeze in news of special rates aboard the 58.52m motor yacht Islander in the Adriatic this summer. A high volume, spacious yacht delivered by Australian Yacht Builders in 1991 to a design by Glade Johnson, she enjoys a particularly large sun deck with a full central bar area, informal dining areas, barbecue and a large swimming pool, with Jacuzzi jets, that can be filled with either fresh or sea water. Islander can accommodate 10-12 guests in five staterooms and a convertible study, all with ensuite bathrooms and is available at weekly rates starting from $195,000. 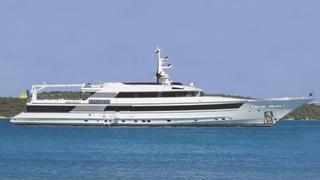 Islander is also listed for sale by YPI asking $10 million.